Voyage London are South East London's luxury mini coach and executive minbus operator based in Bexley. 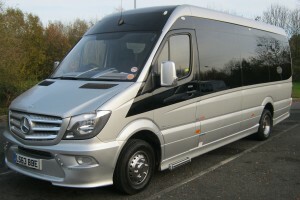 Our Mercedes Benz extra long mini coach model provides superior legroom for 16 passengers and the large rear boot ensures safe storage of luggage. Our passengers enjoy a level of comfort usually only found on larger coaches, eg individual air-conditioning controls and reading lights, large panoramic tinted privacy windows and reclining leather seats with armrests and headrests, dvd player with drop down screen and mood lighting. Our Ford Trend model also seats up to 16 passengers and has overhead storage shelves for convenient stowage, individual air-conditioning controls, reading lights, large panoramic windows, reclining seats with armrests and headrests. There is also USB charging points throughout the vehicle, bluetooth sound system and colour changing party/mood lighting. We provide one way or return travel, day trips, overnight trips, weekly tours. We are also ideal for wedding bookings, for when you want to transfer your family and friends on your special day.. If you want to start your group holiday together, why not contact Voyage London to discuss your airport and cruise port transfer requirements. We strive to provide competitive quotations on any travel requirement you may have. Our uniformed experienced male/female chauffeurs guarantee a professional, reliable and friendly 1st class service second to none. Voyage London currently holds a International licence. "timing etc went according to plan driver professional, friendly and helpful and not overly "chatty" vehicle perfect apart from being a little snug for 4 across the rear seat." "Brilliant service - very prompt. The driver was really efficient, helpful and friendly. The vehicle was clean and very comfortable. Would highly recommend." "Just wanted to say a big thank you for Saturday night. The mini bus was very clean, comfortable and plush; your driver was friendly, polite and very punctual at both the start and end of the evening, and went out of his way to accommodate our little group’s toilet stops (!). We’ll definitely be recommending your service to friends. Thanks again, and best wishes"
"The minibus was comfortable, and modern. The driver was fantastic, he was very friendly and arrived on time for both journeys. We will definitely use this service again." "Really happy with this company. From booking the trip the whole experience has been simple and easy. John arrived on time for the collection on both journeys. Very friendly man and a great driver, which you want for long motorway journeys. The coach was very clean and comfortable. We were overall very happy with the company who made the journey smooth, comfortable and stress free. Thank you, we will be in touch again next year!" "Excellent service. Seamless booking, prompt service & smart clean vehicle. All ran smoothly to make our event carefree." "Excellent great company. Driver very prompt, dressed smart, vehicle very clean with air con. The driver couldn’t do enough, it was a wedding party with children and booster seats were provided. Journey was perfect"
"The driver arrived on time and was lovely and friendly. I have never been on such a clean minibus or coach. Other passengers were so impressed they took cards with them"
"Very kind driver, no problems on journey. Lovely company definitely recommend their service." "Great service, on time, reasonable price, can’t fault it, would use them again and recommend the company."